I have been an Android user ever since the first day the first Motorola Droid was available for Verizon back in 2009. Over the years, I’ve accumulated some experience using Android on phones and tablets, and certain apps have made this experience better for me at work. Here’s my list of essential Android apps for business – and all of these apps are FREE. Let me know in the comments below if you have any other suggestions. Let’s start with the standard Google apps, most or all of which come pre-installed on most devices. Not all Google apps are equally useful for business, but these are all quite helpful. Calendar Widget: My most useful business app. 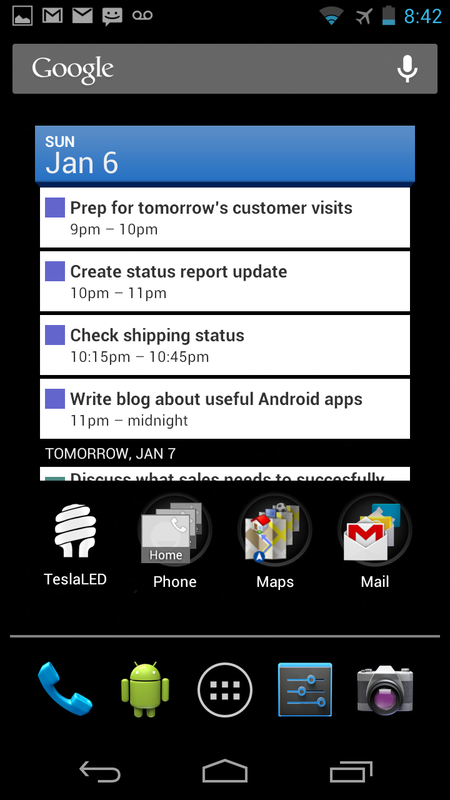 This widget comes built in with your Android device. My home page on my phone is pretty much a nearly fully-screen calendar, plus Google Voice search, a folder for mail apps, a folder for navigation destinations I use a lot (like home and work), a folder for phone numbers I use a lot, and a link to a flashlight app. By the way, you can also edit which apps show up at the bottom of each Android screen – I like phone, Chrome, Settings, and the Camera, since I use those frequently. I hardly ever use any other page on my phone. Chrome: Many older Android devices come with a browser that predated Chrome. Chrome is now the default browser on Android devices. It is stable, fast, and has some nice features (see Chrome to Phone). Chrome to Phone: Chrome to Phone allows you to send web pages from Chrome on your PC or Mac to your phone. Let’s say you’re looking at a hotel web site on your laptop and want to send it to your phone to have the address (for giving directions in the cab) or the phone (for checking to confirm your reservation) – Chrome to Phone to the rescue. Since I often use just my phone in meetings, I often use Chrome to Phone to send reference web pages to my phone in advance. Drive: Drive replaced Google Docs. You can use Google Drive to edit word processing documents and spreadsheets, as well as to view and share presentation documents and files across devices or with other people. As long as you have a network connection, Google Drive is a useful tool. Gmail: Sometimes you need to send yourself information – or deal with personal business while in a meeting. Manage your Gmail accounts with this app. Goggles: Google Goggles may be the Google app that has the most unrealized potential of any Google app. Goggles works well for QR and bar code scans, searching for information on a company by photographing its logo, and a few other applications. Where it falls down, however, is in its most potentially useful area for business – business card scanning. 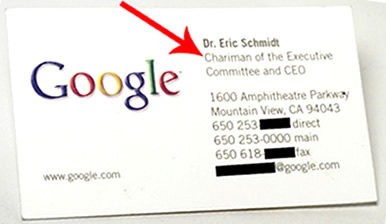 I’ve never successfully scanned a business card with Google Goggles. Worst of all, it doesn’t even work with Google business cards. Mail: Android devices come with a second e-mail app that connects with Exchange servers to send and receive corporate e-mail, set and receive calendar appointments and meetings, and access the corporate directory. If your company, like most, uses Exchange Server for mail and calendar, this app is indispensable. Maps (and Navigation): When heading to a meeting, this app is a great way to get directions, check traffic, and save places (“star” them) for future reference. If I’m going to some exotic foreign location, I often scope out sights and places to see, save them as favorites, and then use Google Maps to walk from one to another. You can get driving, walking, and public transportation directions with the navigation mode, which does turn-by-turn directions. MyTracks: MyTracks is an app that tracks your travels on GPS. You can use MyTracks to trace the route you walked from a parking space to a meeting, so you can find your way back later. You can save any pathway with MyTracks, really useful for retracing your steps particularly when in a strange city. 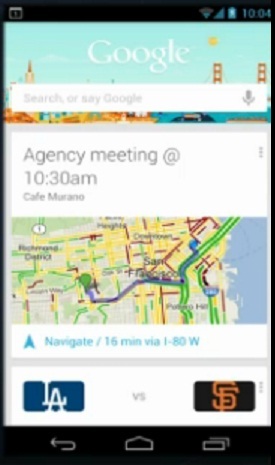 Search (and Google Now, and Voice Search): Google Search is an essential app (and home screen widget). Google Search not only surpasses Siri in voice search, but also includes Google Now, one of the most innovative mobile apps available. Google Now checks your calendar to see what you have coming up, and tells you when it is time to leave based on traffic. It tells you about any delays to upcoming flights, whetherweather in cities you are in or will be in soon, sports teams you care about, and much more. Translate: Helpful for translating web pages, e-mail messages, and phrases. If you want to add a thank you phrase to a message, read an article written in a foreign trade journal, or figure out if you’re at the right restaurant, Google Translate is a must have app. Voice: Google Voice is a great app for staying in touch, as well as for making cheap international calls. You can retrieve messages using a web interface while on the road – most are even transcribed for you automatically, allowing you to get your voice mail via text message, e-mail, or web browser. While not traveling, Google Voice can ring your cell phone and work phone (multiple phones at your choice) for in-bound phone calls. Very handy. Adobe Reader: Open and read PDF files with the authentic app from Adobe. AK Notepad: Simple way to take notes during meetings. Alarm Clock Plus: In my opinion, the best alarm clock to use, particularly when traveling. Very flexible way to set multiple alarms, including in advance. Amazon Kindle: Another good way to read PDF files. Also useful for reading other kinds of documents sent wirelessly to your Android device. Or reading a book (business or otherwise) while above 10,000 feet (listen to your flight attendants!). AnyConnect: Cisco VPN access to corporate intranet from the road. ASTRO File Manager: Astro is like Windows Explorer for your Android device. You can see, open, and manage all your files. Especially useful for finding that attachment you just downloaded. 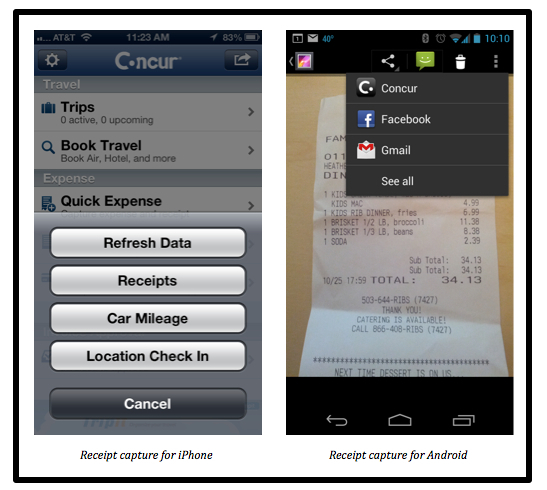 Concur: If your company, like mine, uses Concur for expense reporting, this mobile app allows you to take note of any expense while traveling by taking a photo of the receipt and uploading the image. Very helpful for getting those expense reports in in a timely manner. Dictionary: Sometimes you run into a word you don’t really know – this is a handy app for looking up the definition of a word. DroidRecord: There are lots of times when you need to record a meeting – in compliance with all laws and ethics. DroidRecord is the app to record these meetings for future reference. Evernote: Some meetings require more sophisticated notetaking, including words, drawings, and photos (screen shots of PowerPoints is a lot more efficient than trying to type it all in or take notes on a presentation you won’t get until later). Evernote is a cross-platform app that works on many devices (not just Android devices), and allows you to sync notes across them for future reference. 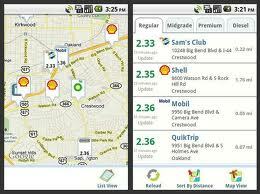 GasBuddy: GasBuddy helps you find gas stations when you’re driving around. 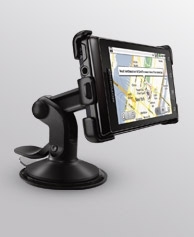 Plus, you can find the best price when you need it, and it connects to Google Navigate to get you turn-by-turn directions to the gas station of your choice. Kingston Office: I prefer Kingston Office to other Microsoft Office-compatible document editors. It’s free and works well. Magnificient Magnifier HD: Great little app for magnifying anything small you can’t easily read, including magnifying, lighting up the item, and taking a picture. Very handy for things like serial numbers, which are maddeningly small for folks my age. Okta: If your company uses Okta for single sign-on, this app can be set up by your IT folks to give you convenient access to everything from everywhere. PDANet: A lot of carriers charge a monthly fee for using your phone as a hotspot or for tethering. With PDANet, you can use your cell phone’s data plan over a Bluetooth or micro-USB cable to get network connectivity on your laptop if you don’t have a cellular modem for your computer. The free version of PDANetcan be used to access any non-secure web site (http) or Internet connection (this works for Outlook for most companies!). For a small, one-time fee ($20), you can also access secure connections (https). 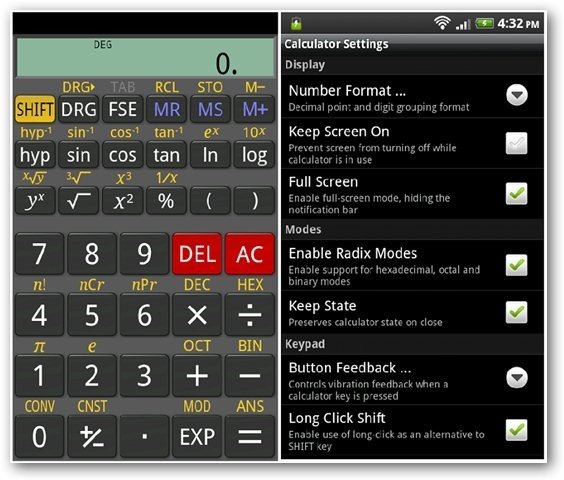 RealCalc: Great scientific calculator. Good for most business calculations. For you financial geek types, there are calculators compatible with your HP-41C if you need one. Salesforce Mobile: Just about everyone uses Salesforce.com for CRM these days, and Salesforce Mobile gives you a great way to use it from anywhere. Skype: So many people use Skype to stay in touch, that this app is indispensable. If you use Verizon, you’ll need this version of Skype instead. Skype may be the best Microsoft app ever! Stopwatch & Timer: Ever need to time a presentation, to make sure you don’t run out of time during a speaking slot? Good for timing demos, presentations, or anything else. Swype: Not available on the Google Play store. Google Swype revolutionized text input on mobile devices. 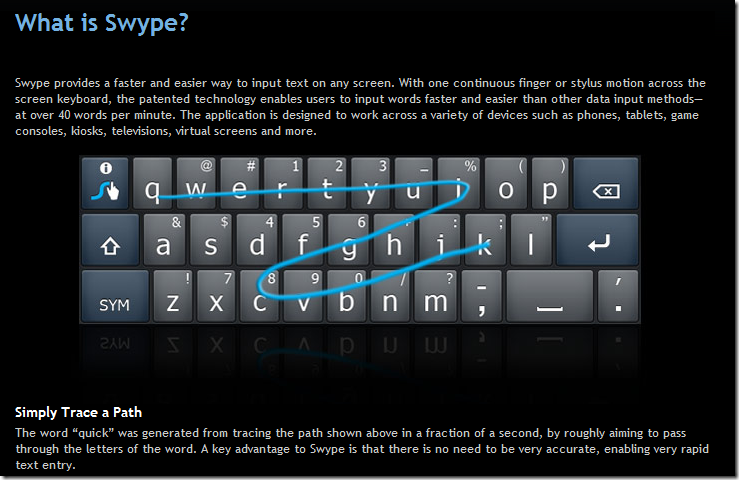 If you have trouble typing on the small, on-screen keyboards, or if you think you can’t give up your Blackberry, you’ll love Swype. Seriously, I was a HUGE Blackberry user, and Swype allowed me to type two or three times faster and more accurately than I ever could on a Blackberry keypad. However, if you get Android 4.2 Jelly Bean, there is a built-in keyboard replacement that uses the same approach as Swype, so Swype’s days may be numbered. TeslaLED: You just need a flashlight sometimes, and this one works on just about every device I’ve ever tried. TripIt: Organize all your travel info, if you fly a lot. WebEx: I do a lot of web and teleconferences, most of them on WebEx. This app allows me to join in on any WebEx conference from anywhere. I can’t present using this app, but I can view the web conference. I’ve used this in airports, my car, and many other places where I just couldn’t conveniently use my laptop. Where’s My Droid: Some Droid devices come with a “find my phone” app – this app is for the rest of us. Easily locate your device when you’ve mislaid it. Keep your phone secure with a password, regardless, for those rare times when you may have actually lost your phone. Ask your IT shop if they can remotely wipe and disable your phone if it is really lost. Wifi Analyzer: Find the best WiFi signal when you have a choice. Of course, also useful for setting up your WiFi at home or in the office. Wikipedia: Sometimes, you just have to look things up. Of course, you can always do this just using your browser if you prefer. I still haven’t found two free apps I’d love to have – a great business card scanner and a document scanner (including optical character recognition – OCR). Some folks love their iOS devices, and some won’t give up their Blackberries, but I love Android. Android has great voice input, Swype, widgets on the home screen, great integration with Google Apps, and all these great free apps. Let me know if you have other favorites or your thoughts on this list in the comments area below. Enjoy! Bump is a good app for exchanging business info -it requires that the other person has Bump as well on their phone. All that’s then needed is to literally bump the phones to each other and Voila! You should check out http://androidappsforbusiness.com when you get a chance. It has a nice selection of business apps.